Hostess Brands Inc., the maker of Wonder Bread and Twinkies, re-filed for Chapter 11 bankruptcy protection Wednesday, just two years after emerging. People familiar with the matter said the company is facing a cash crunch with more than $860 million in debt, high labor expenses and rising ingredient costs. "Hostess's filing would mark what is known as a Chapter 22 proceeding in restructuring circles, since the company had already sought bankruptcy protection once before," the Wall Street Journal noted in a story Tuesday previewing the announcement. When the company, then called Interstate Bakeries and based in Kansas City, Mo., filed for bankruptcy protection in 2004, it blamed low sales and high fixed costs. It emerged in February 2009. Is it time for McDonald's to retire Ronald? Hostess Brands employs about 19,000 workers and operates in 49 states. Annual sales are about $2 billion, according to the company's website. Hostess' private-equity owner, Ripplewood Holdings, put $40 million into Hostess last year, and hedge funds including Monarch Alternative Capital and Silver Point Capital loaned the company $20 million late in 2011. Sales of Hostess Twinkies have declined at a time when the market for bakery snacks has been flat. 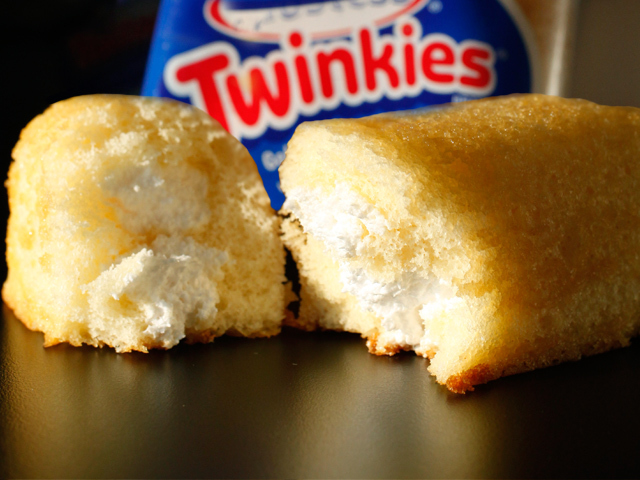 Nearly 36 million packages of Twinkies were sold in the year ended Dec. 25. That's a drop of almost 2% from a year earlier, according to data from SymphonyIRI Group, a Chicago-based market-research firm that captures sales from major retail outlets, excluding big-box stores.